, listen, and learn. Robin instructed the participants around the ring and across the sounding board, then engaged the auditors to act as judges picking the top 4 and asking “why” they selected them. She then provided her perspective as a judge. This was beneficial to all as she provided the criteria for a class and how a judge rates and pins each horse. With this insight, there may be more interest in competing at shows in the future. The clinic closed with a Q&A session. Questions covered tack, rules, and additional clarifications on what they had learned and went well past the hour allocated. No one wanted to leave, but many had hours to drive home. As we said our good-byes to everyone, there was a couple of common comments. Everyone loved Robin, everyone loved the clinic and Open House, and everyone wanted to come back. 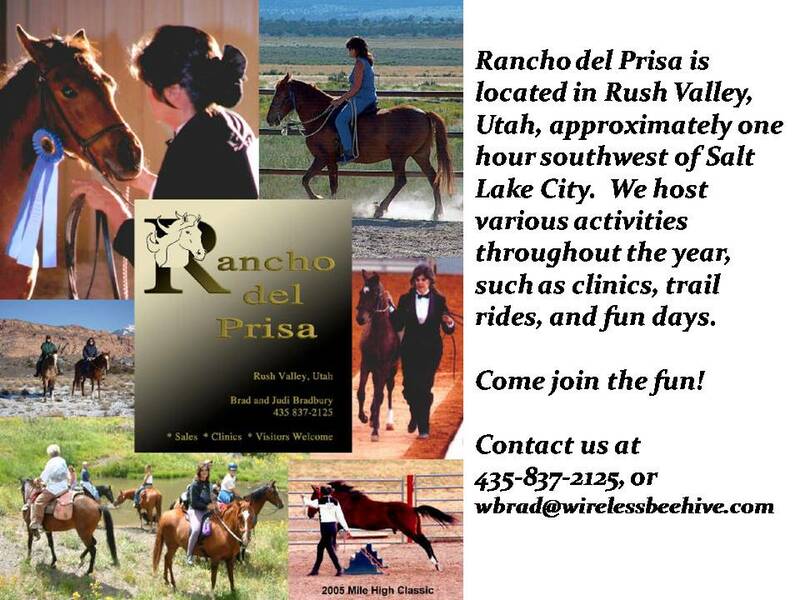 We cannot thank Robin Ratliff enough for coming to Utah and helping so many people and their beloved Paso Finos. Above, Rebecca Connor rides her stallion in the indoor during the rain. Above Right, the rain clouds clear and the day turns beautiful. Below, Dana and Mark Shepherd enjoy the clinic and JOIN Great Western! Congratulations to them! Far below left, Michelle Sidun works on her gait. Below middle, Robin Ratliff discuses the nuances of collection with one group. Below far right, Jenny Sullivan enjoys her free lesson on her new horse. In the Right column we see Annette Rowberry enjoying La Mancha, a group getting lessons from Robin, the clinic moved outdoors on Saturday once the rain stopped, and finally, at the end of the clinic, everyone, including Tia was dog tired. Great Western continues to search for articles of interest to our membership. If you have article you would like to share please send it to the webmaster.